Fiji’s main international airport is Nadi International Airport, which roughly 95% of its international flights fly through. The nation’s capital is Suva, though the town of Nasinu is considered to have more residents. Travel in Fiji can be quite expensive, with even the most stringent of travelers seeing prices of $60 to $70 a day. Fiji can be a touristy nation, and visitors should expect to pay tourist prices on nearly everything. This is especially true during July through September, the tourism peak season. Weather in Fiji stays between 18 and 30˚C (65-85ºF) all year, with a dry season from May to October and a wet season from November through April. Coconut dolls and handmade crafts exemplify the classic Fijian souvenir. The small island nation of Fiji sits in the Pacific Ocean, northeast of New Zealand. In total, Fiji consists of nearly 350 individual islands, of which about a third are inhabited. Two of the islands, Viti Levu and Vanua Levu, are significantly bigger than the other islands and hold the vast majority of the country’s population. Since the 1960s, Fiji has been an extremely famous location for beach resorts, and today much of the country’s economy is based on tourism. Although this means that the hotels, restaurants, and other tourist amenities are of the highest quality, it also makes the country expensive to travel in. This is especially true of Viti Levu, which contains all three of the nation’s biggest cities. The history of Fiji is not well documented, and there is still much to learn of its peoples. The first known inhabitants were the Lapita, who are estimated to have reached the island as much as 5000 years ago. Evidence exists that the Lapita traded heavily with other Melanesian and Polynesian cultures. Over time, the native peoples of Fiji developed a culture very distinct from the original Lapita, which was characterized largely by tribal warfare and cannibalism. Due to rumours of the ferocity of the Fiji peoples, Europeans largely avoided the islands, which were mainly isolated until Dutch explorer Abel Tasman landed on the island in 1643. Even then, it would take another two centuries before Europeans formed any permanent settlements. In 1874, the English claimed the island, but implemented a policy against the use of natives as forced labour. For this reason, nearly 100,000 Indians were imported and forced to establish a massive sugarcane industry. In 1970, Fiji was granted its independence. Twice in 1987, the country experienced military coups, and also temporarily changed its name to Dominance. Though democracy was soon returned, Fiji has experienced several subsequent coups, including one in 2000 and 2006. However, the Fijian government is today relatively stable, and most travelers in Fiji are barely aware that any political strife exists. Although its population size was recently surpassed by Nasinu, Fiji’s capital Suva is still the bustling centre of the island nation. Suva is very much an industrial, business-oriented city, but there’s still a handful of activities for tourists. The city is known for its outdoor fruit and crafts markets. The city also contains the national museum, fittingly called the Fiji Museum. This interesting attraction houses a number of artifacts relating both to Fiji and the entire South Pacific region. Because of the huge number of Indians working in Suva, the city has a number of fantastic Indian restaurants, as well as a handful of other ethnic eateries. The city of Nadi is considered the tourist capital of Fiji. Though many travelers use Nadi simply as a stepping stone to other parts of the nation, the city itself has a great deal of charm. Nadi’s Hindu Temple is a colourful site that has become something a symbol of the city. Nadi is a coastal city with a number of good beaches. Wailoaloa Beach is one of the more popular beaches, and it sits near most of the city’s major nightlife destinations and restaurants. The Nadi Garden of the Sleeping Giant, a lovely botanical garden, is also worth a visit, if only to see its exquisite collection of tropical orchids. Located just south of Nadi is Denarau. This private island is considered the centre of Fiji’s upscale tourist industry and holds many of its all-inclusive resorts. The island also has a world class golf course. Though Denarau isn’t really that indicative of authentic Fijian life, the sheer luxury of the island is worth seeing. Denarau is also home to a number of Western chain restaurants and shops, which is perfect for travelers experiencing a bit of home sickness. The huge number of tourists in this area also means that a number of fascinating day trips leave from Denarau’s port, often to the nearby, uninhabited islands. This can be one of the easiest ways to reach the wild islands. 1. 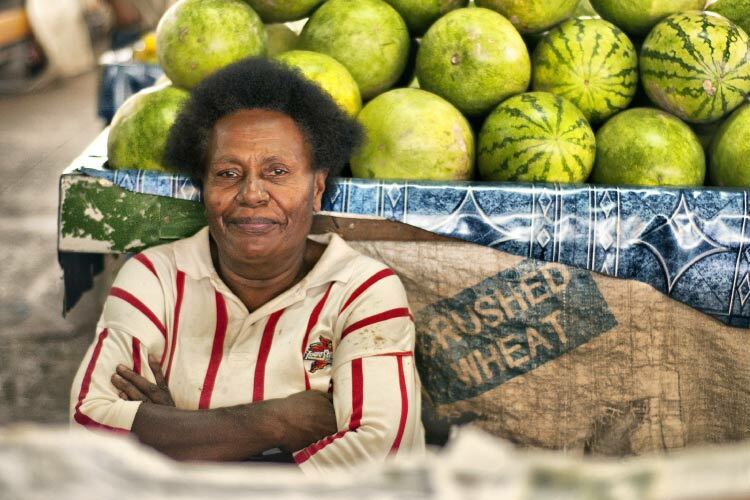 Be sure to shop in Suva’s downtown street markets, which specialize in fruits and vegetables. These stands are down the street from Suva’s Municipal Handicraft Centre, a fascinating market with some of Fiji’s best artisans. The Fiji Museum is also worth a visit for travelers interested in the Fiji’s heritage. 2. 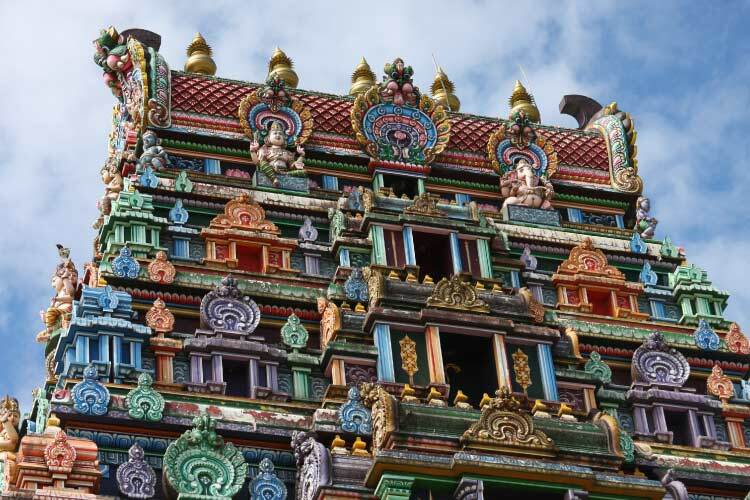 In Nadi, visit the colourful and massive Hindu Temple (Pictured below). Then, visit the beautiful Nadi Garden of the Sleeping Giant, a large botanical garden with a fantastic tropical orchid collection. 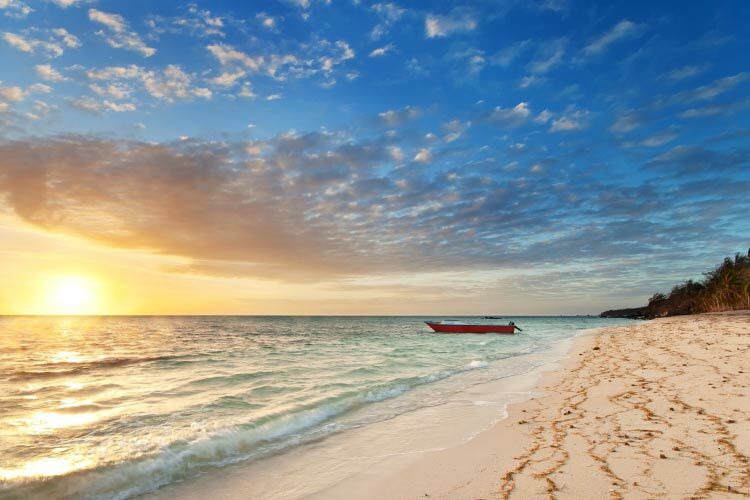 When it’s time to unwind, head to Wailoaloa Beach in north Nadi. This area also contains a number of nightclubs and restaurants. 3.Near Nadi sits Vuda Point, a popular haven for yachts and home to a few resorts. Travelers typically come to Vuda Point for two reasons: to see million-dollar yachts and to explore the artificial island, which is shaped like a footprint. However, the area does have a few beaches and some natural areas which are worth exploring. 4. Some of Fiji’s best fine dining is in the resorts of the tourist island haven of Denarau. Be sure to play some golf while you’re there, as it’s one of the world’s best courses. Denarau also contains a few nightclubs and miles of sandy white beaches. Be sure to check out all the various attractions put on by the numerous resorts spread throughout Denarau. 5. The Mamanuca Island chain is composed of 20 tiny islands of Fiji’s coast, which are easily reachable from Denarau. The volcanic archipelago is popular among travelers for its great beaches and charming villages. Off the coast of the islands sits a vibrant coral reef that’s ideal for snorkelers and divers. 6. 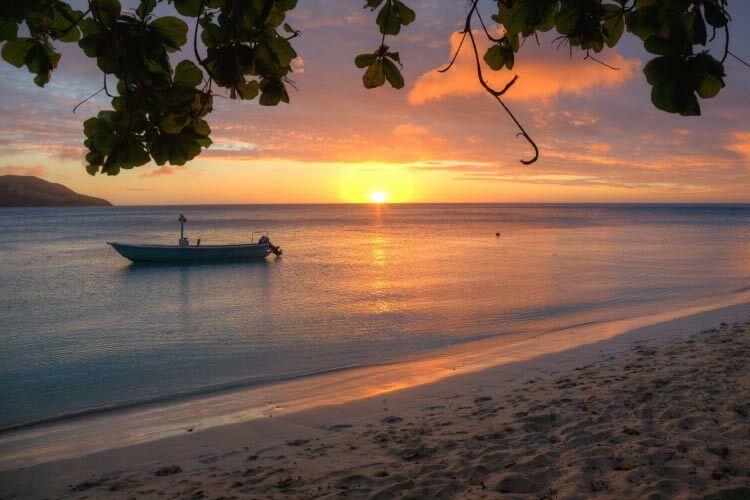 The Yasawa Islands are known as resort paradises in Fiji. Though this island group holds more than 30 resorts, there’s still a number of beautiful natural areas in Yasawa. Popular ecotourist destinations include the Sawa-I-Lua Caves and Wayalailai Natural Resort. There are also a number of reefs for divers. 7. 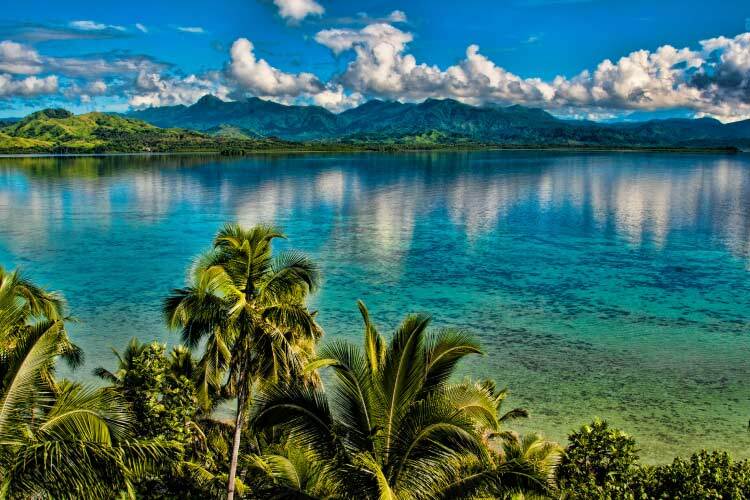 Vanua Levu is the Fiji’s second largest island, though it remains much more wild than Viti Levu. 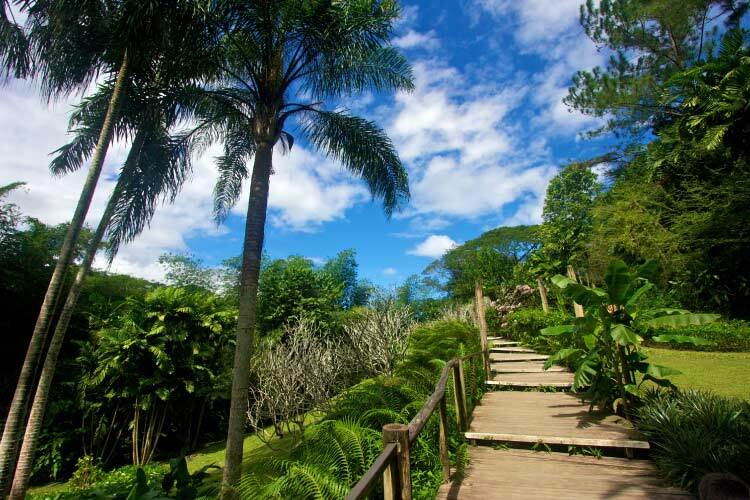 The stunning Waisali Rainforest Reserve occupies a large portion of land on the island. There’s also a number of great spots for snorkeling and diving, as much of the island is surrounded by coral reef.